The purest version of the “October surprise” is a political bombshell that no one sees coming. In the closing days of the craziest campaign in modern history, we have just been witnesses to an October surprise so pure it would qualify for an Ivory Soap commercial (“99 and 44/100 percent pure”). When FBI Director James Comey sent a letter to certain members of Congress about a new development in the long-running Hillary Clinton email mess, the resulting earthquake could be picked up by a seismograph. There are very legitimate questions about whether Director Comey was right or wrong to do what he did. It's indisputable that Comey broke normal FBI practice in order to comment publicly on an incomplete, ongoing investigation. Moreover, Comey violated longstanding FBI standards that prohibit announcements within 60 days of an election that would influence the public's choice. Just 11 days before Nov. 8, Comey took an unprecedented step that could affect the outcome of an election for president and Congress. The vagueness and ambiguity of his letter to some senior members of Congress guaranteed a leak to the press within five nanoseconds, and invited the rankest speculation from Clinton's opponents. To the extent that Clinton loses ground this week, and falls behind in battleground states where she had been leading, we will call this “the Comey Effect.” Similarly, if Comey's decision results in Republicans holding onto the Senate and losing fewer House seats because he has invigorated their “checks and balances” argument, we will also attribute this to the Comey Effect. The all-emails-all-the-time media coverage has already had an impact on the presidential race. Polls were tightening a bit before this, mainly due to some reluctant Republican partisans returning home at the end to their party's ticket. We also need to remember something that has defined this race: The candidate in the spotlight, except for the convention period, has generally suffered in the polls 1. After the conclusion of the third debate, the focus seemed to move back to Clinton, as negative headlines about the Affordable Care Act and the daily trickle of sometimes embarrassing emails from WikiLeaks' John Podesta treasure trove accumulated. This took the focus off of Donald Trump and put it on Clinton -- and the Comey Effect has kept the spotlight on her. That the Democrats have struck back so hard against Comey, with some even calling for his resignation, indicates the seriousness with which they are treating this new development in the race. Republicans will thrill to the Comey Effect. Democrats will heatedly denounce it. Yet it is real and impossible to ignore, and the FBI director's extremely controversial move must be noted in the Crystal Ball, and maybe even in the history books. Still, Clinton remains the clear favorite in the race, and there were not immediate signs that the overall race dramatically changed as a result of the Comey Effect. However, the race may have been getting closer anyway. As of our last writing (Thursday), we noted that we hadn't seen all that much tightening in the polls, although what little we did spy then intensified to some degree. After Bloomberg produced a seeming-outlier poll of Florida last week (Trump was leading by two when almost every other poll showed Clinton up a few points), the New York Times Upshot/Siena found Trump up four points in a poll released Sunday morning. An ABC News/Washington Post national tracking poll that had Clinton up an unrealistic 12 points has narrowed to one point. Still, not all the polling news has been bad for Clinton -- far from it, actually. Several state-level surveys conducted by CBS/YouGov that included polling on Friday, the day of the Comey letter, produced generally favorable results for Clinton, and a Politico/Morning Consult poll found Clinton with a small, three-point lead that was the same in polling both before and after Comey's intervention. If the Comey Effect just hardens partisan attitudes, and there are some indications that is happening, then perhaps it may not change much. As of this writing (Monday afternoon), Clinton leads in every national poll now except for the controversial University of Southern California/Los Angeles Times panel, a survey that has had a pronounced Republican lean the entire cycle. Some of the national polls, though, are very close. Her leads in Rust Belt states like Michigan, Pennsylvania, and Wisconsin appear durable, although Trump's team is arguing that it can put these states into play. We agree that a potential path to victory for Trump might include one or more of these states, but at this point there's precious little indication from polling that he can win them: Clinton has led every post-convention poll in each state included in the RealClearPolitics average. Clinton also seems to have a small but clear edge in North Carolina, a state that Trump almost certainly needs to have a credible path to 270 electoral votes. And while polls are also close in Nevada, shrewd Silver State analyst Jon Ralston has been tracking the state's early vote and has concluded 2 it looks a lot like 2012, when Barack Obama won the state by nearly seven points. “Trump appears to have no path here,” Ralston wrote about Nevada on Monday morning. However, the potential outcomes in some of the most competitive states on the Electoral College map are now more uncertain. These developments, along with recent polling data, precipitate ratings shifts in Arizona, Florida, and Ohio. We are moving all three from Leans Democratic to Toss-up. Arizona was always going to be the toughest Democratic gain for Clinton to pull off, considering it's a state that Mitt Romney carried by nine points in 2012. The polling margins in the Grand Canyon State remain very close -- RealClearPolitics shows Clinton up by less than one point while HuffPost Pollster finds Trump ahead by one -- but the last couple of polls have shown Trump very narrowly ahead. There are still demographic trends that could help Clinton carry Arizona's electoral votes, but Toss-up is the more appropriate rating. The story in Florida is largely the same one as in each of the past four presidential cycles: the state could be decided by a razor-thin margin. Republicans have been buoyed by the most recent public survey, the aforementioned New York Times/Siena poll that found Trump ahead by four points, and Trump now leads the RealClearPolitics average by a half point while Clinton retains a three-point lead in HuffPost Pollster. While early voting data can sometimes create something of a Rorschach test, there is some good news in the Florida data for Clinton: Based on votes cast so far, registered Republicans and registered Democrats have almost identical totals 3, an improvement 4 for Democrats compared to 2012 at the same point. Importantly, the share of all early and absentee votes cast by Hispanics is also notably higher than in 2012 5. Perhaps 70% of Florida's votes will be cast before Nov. 8 6, so where these party ID numbers end up will be consequential. The mixed signals in Florida necessitate a move to Toss-up, especially as we watch for possible shifts due to the Comey Effect. There has suddenly been a relative dearth of public polling in Ohio, but the state has been more Republican-leaning than some of the other battlegrounds in this cycle. We suspect that Trump's percentage of the vote will be at least a couple of points higher in Ohio than it is nationally (Ohio typically leans right compared to the nation, and that lean may be more pronounced 7 in this election). Previously, we figured that if Clinton was in line to win nationally by somewhere around or in between Obama's 2008 (seven points) and 2012 (four points) national performances, this -- combined with her field operation -- would be enough to get her over the finish line in Ohio. But now that things may be closing a bit nationally, it's harder to see any edge at all for Clinton in the Buckeye State. Ohio and Iowa, another Toss-up, remain the lowest-hanging fruit for Trump among those states that voted for Obama twice. The overall point on these ratings changes is that all of them were leaning to Clinton only slightly, so a subtle change in the race is enough to merit listing them as Toss-ups for now. 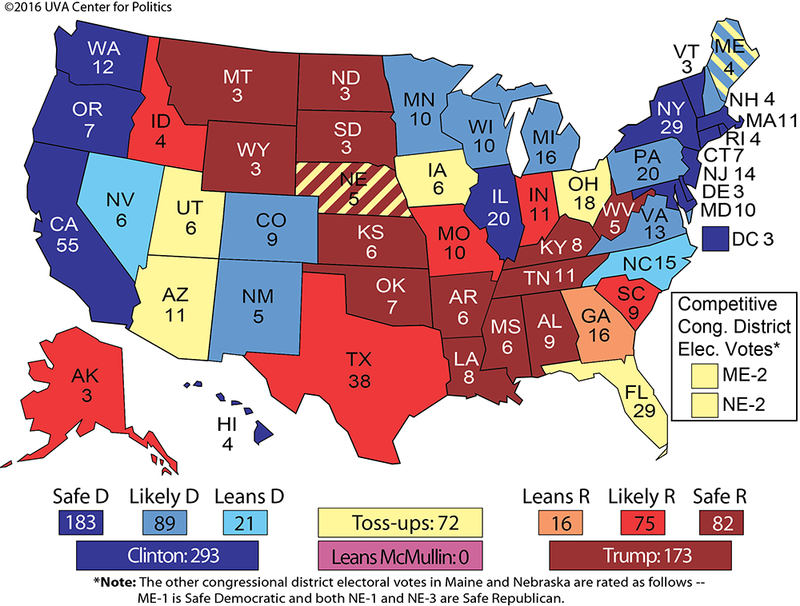 These changes still leave Trump at just 173 electoral votes in his column -- the same as the number John McCain won in 2008 -- but Clinton has been downgraded to 293, with 72 electoral votes in the Toss-up category. So she's still in decent shape. Yet the Comey Effect, plus some related and unrelated Republican consolidation in the final days, has introduced more uncertainty into a number of states. We also have one ratings change in the Senate. The race in Wisconsin has largely been a sidebar in the 2016 cycle, but there are suddenly signs that it may be more competitive than expected. While ex-Sen. Russ Feingold (D) has led all but one public poll, there is debate over just how large his lead may be. Senate Majority PAC, a Super PAC supporting Democratic Senate candidates, raised eyebrows 8 when it announced a $2 million investment in the Badger State late last week. The new spending there might signal concerns about Feingold's edge over Sen. Ron Johnson (R), who beat Feingold in 2010 and has received more outside help than his Democratic opponent. We still think Feingold is ahead, but we are shifting our rating in Wisconsin from Likely Democratic to Leans Democratic. Interestingly, Feingold is seeking to become the first former senator to win back his old seat against the candidate who beat him since Sen. Peter Gerry (D-RI) in 1934. If Johnson pulls the upset, that would likely save the Republican Senate majority even as six Toss-ups remain. We'll be back Thursday with a regular edition of the Crystal Ball, and then we'll provide our final analysis and calls next Monday.